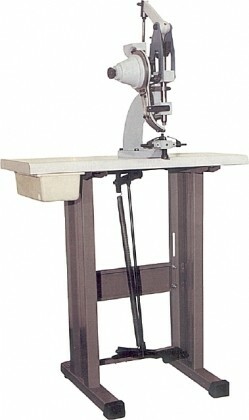 Versatile, cost effective manual machine with auto feed. his manual semi-automatic eyeleting machine. Feeds the eyelet to the setting dies via a hopper fed raceway and then in a single action punches out a hole in the material while simultaneously setting the eyelet without the operator having to handle the components. Sets eyelets in a variety of materials including plastic, paper and leather. Cuts hole in your material and sets eyelets in one action. No electrical or pneumatic connections required. Back and side stop for accurate placement of work. Foot pedal operation leaves both hands free. By changing the dies, bowls and raceway, different sizes of eyelet can be used.